A sinkhole is a depression in the ground that has no natural external surface drainage. Basically, this means that when it rains, all of the water stays inside the sinkhole and typically drains into the subsurface. Sinkholes are most common in what geologists call, “karst terrain.” These are regions where the types of rock below the land surface can naturally be dissolved by groundwater circulating through them. Soluble rocks include salt beds and domes, gypsum, and limestone and other carbonate rock. Florida, for instance, is an area largely underlain by limestone and is highly susceptible to sinkholes. When water from rainfall moves down through the soil, these types of rock begin to dissolve. This creates underground spaces and caverns. Sinkholes are dramatic because the land usually stays intact for a period of time until the underground spaces just get too big. If there is not enough support for the land above the spaces, then a sudden collapse of the land surface can occur. 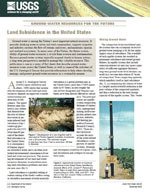 Find more information about sinkholes at the USGS Water Science School. Why are there no entries for caves or military installations in the Geographic Names Information System Database? What is the difference between a sinkhole and a pothole? What is the largest sinkhole in the United States? What is the difference between a sinkhole and land subsidence? How many sinkholes open up in a year? There is no database of sinkhole collapses for the United States, so these data are unavailable. Some individual state geologic surveys track reported collapses within their state. Many sinkhole collapses are not reported to authorities or news organizations, and many occur in rural areas where they are unobserved. How much does sinkhole damage cost each year in the United States? Sinkhole damages over the last 15 years cost on average at least $300 million per year. Since there is no national tracking of sinkhole damage costs, this estimate is probably much lower than the actual cost. 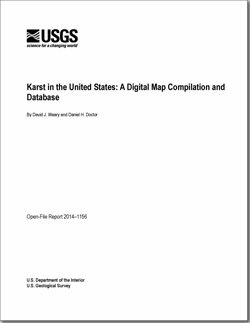 Weary, David J.; Doctor, Daniel H.
Karst in the United States: a digital map compilation and database; 2014; OFR; 2014-1156; Weary, David J.; Doctor, Daniel H.
Sinkholes are a common feature in Missouri where limestone and dolomite outcrop. Though often considered a benign nuisance, sudden, catastrophic collapses can destroy property, delay construction projects, and contaminate ground water resources. Sinkholes; 2007; FS; 2007-3060; Kaufmann, James E.
Galloway, Devin L.; Jones, David R.; Ingebritsen, S.E. 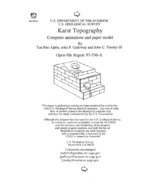 Land subsidence in the United States; 2000; FS; 165-00; Galloway, Devin L.; Jones, David R.; Ingebritsen, S. E.
Land subsidence in the United States; 1999; CIR; 1182; Edited by Galloway, Devin L.; Jones, David R.; Ingebritsen, S. E.
Alpha, T.R. 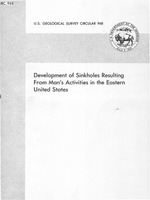 ; Galloway, John P.; Tinsley, J. C.
Development of sinkholes resulting from man's activities in the Eastern United States; 1987; CIR; 968; Newton, John G.
Formation of solution-subsidence sinkholes above salt beds; 1984; CIR; 897; Ege, John R.
Karst landscapes are more prone to have land subsidence and sinkholes. Map of U.S. showing karst areas, which are prone to land subsidence and sinkholes. Examples of karst features within the Buffalo National River Park. Karst is a type of topography that is formed over limestone, dolomite, or gypsum by dissolving or solution, and that is characterized by closed depressions or sinkholes, caves, and underground drainage (American Geological Institute Dictionary of Geologic Terms).